I adore Fall. It is my absolute favorite time of the year! But it is also when life starts to get reaalllly busy. So this year I have decided that I am going to simplify dinner time by making good use of the old Crock Pot. I just love my crock pot!! I don't claim to be the first one to come up with this idea. I've seen it floating around the internets here and there. But here's my easy-peasy crock pot baked potato recipe. If you can really call it a recipe. Lol! At my house we like red potatoes, so that's what I used, but this works equally well with Russets...although you might have to add an hour or so of cooking time. Step 1. Pick out and wash 6 or so potatoes. Then prick them with a fork. Step 2. Wrap each potato in tin foil. Seriously. That's it. It's a fabulous way to enjoy baked potatoes with any meal. Pop them in the crock pot in the morning and they're ready by dinner. Love it! Do you have any great crock pot meals? Anything surprising that you make in the crock pot?? I'd love to know. I love this idea because sometimes potatoes can take so long. Yummy! I'm a HUGE Crock Pot fan, I love this! Pinning it! What an easy and yummy slow cooker recipe! YUMMY! 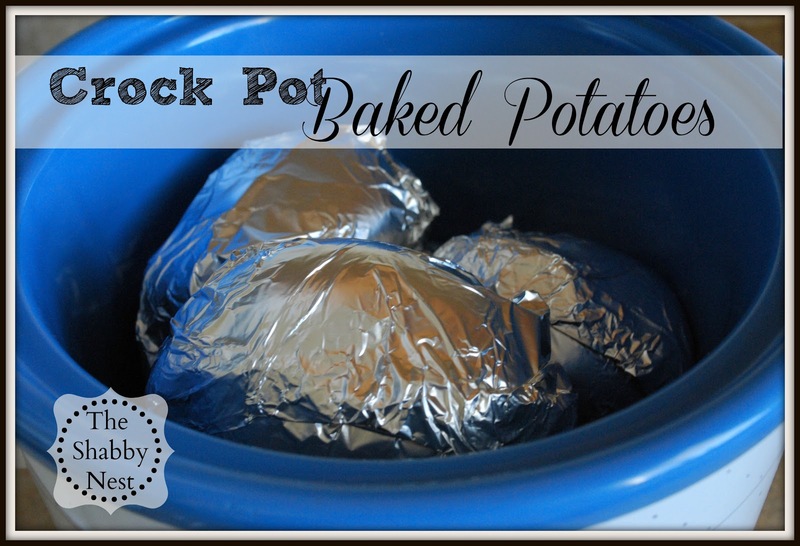 I have heard of baking potatoes in the crock pot but I have never tried it. I think I will!